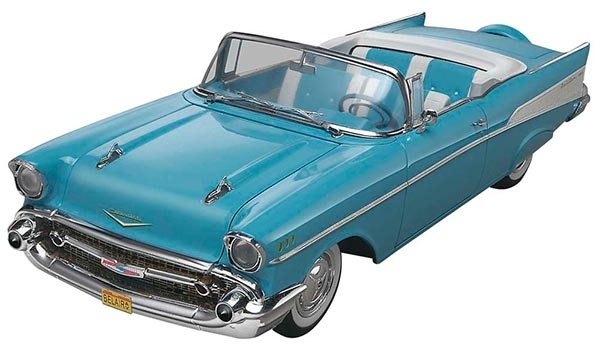 Smaller, lighter, more aerodynamic, and easier to maintain than the cars of its day, the 1957 Chevy was a staple of the NASCAR circuit, club races, and the drag strip. Its overhead-valve V8 small-block engine produced 162 horsepower. When equipped with a 4-speed manual transmission, the '57 Chevy could leave the opposition in the dust. Even the convertibles, usually slower because of wind drag, were able to win all 3 stock car racing driver championships for the convertible class. Kit features convertible top and dual carbs with "bat-wing" air cleaner.